I like Locodol for many of the reasons I continued to like anime after getting past my action phase, and I like it quite a bit. It set up the premise of small-town idols doing small-town promotional work and has thus far gotten plenty of mileage from the combination of the bite-sized details of the job (product placement, concerts that get rained out, and mascot character backstories) and each character’s personality. The cast compliments each other really well, and is complete enough that they were able to put the two most normal characters in a room together for Nanako’s failed karaoke bonding event and pulled off a pretty solid intentionally awkward atmosphere. If a show has both a distinct identity, a solid cast, and embraces both those aspects, it’s going to be hard not to enjoy. Ao Haru Ride has been a treat. Aside from fairly shamelessly running a lot of (smart) first-person camera plays in handling scenes between Kou and Futaba, it’s done a good job developing the larger cast around the two in ways that make them, if not incredibly complex, then at least relevant to the central mystery of the plot – what happened with Kou and Yoichi’s family three years ago? The answer to that question doesn’t really defy the imagination, but I expect it’ll be revealed in a piecemeal fashion to the cast, and watching them handle it as a group figures to be very, very fascinating. I’m split on Barakamon at the moment. It’s got a lot of attributes which are solid plusses; Naru’s voice actress, Tamako’s silent fujoshi hypocrisy, and Naru’s general ability as a wild-child X-factor to make any half-episode skit interesting while occupying space onscreen. But I’ve been cooling off on the show as a whole, because Handa has, between a straightforaward maturation arc that’s somewhat repetitive recently and the loss of his cranky side as a result of said arc, lost a lot of my interest at this point. Being lukewarm on this in a busy season means it’s probably going to be on the shelf unless I find some spare time for it later. I quit on Aldnoah Zero pretty quickly because, in spite of some top-shelf SFX, I couldn’t find a story thread worth latching on to. Every character in the show, from the detached protagonist to the blatantly racist and laughably villainous prussian aliens felt like the product of a mailed-in writing job. I’m not going to begrudge Urobouchi Gen a couple more years of Keep Gettin’ Dem Checks performances, but I still would have liked to have seen more effort from the writing team on this one. For Mobile Suit Gundam-san, which has done nothing but make me laugh and/or smile over the past half-year. It needs to be more frequently broadcast, though; going to once-a-week shorts after the daily clockwork schedule Puchimas was on just doesn’t feel right. Gekkan Shojo Nozaki-kun is adapted from a manga about manga, so in a way it’s kind of fitting that it’s about as cutpaste a manga adaptation as possible. I mean, the humor in the series is there, and it’s good, but the anime doesn’t really add jack that makes seeing it again feel worthwhile. The voices, in particular, have been a lot less amusing than I had hoped they would be. I’m still very much a follower of the series, but not the anime. Watching Leorio get haplessly mixed up in political shenanigans has been extra nice with his having Hiroshi Nohara’s voice. It’s a shame HxH as a weekly Tuesday time-killer will be gone in a few weeks, but it’s not like they had a lot of options. Togashi takes time off and hasn’t written a whole ton of manga beyond what’s already been animated, partly due to health issues and partly because some people just take more time to write stories they’re ok with. It’s been an excellent ride. The obvious answer there is that I don’t much care. Persona 4: The Golden had, in its Christmas episode, the funniest single episode of the season (albeit behind like half of Puchimas double exclamation point). The way misunderstandings stacked up there, aided by a bunch of ironic cutaways throughout the buildup, was pretty impressive and yielded a bumper crop of catch-and-shoot humor. The show being a straight-up highlight reel, it’s seen variations in the level of humor from episode to episode, but when it gets wacky, it gets wacky. That, and it rolled a pretty effective dramatic episode focusing on loner-turned-antagonist Adachi to the get the audience geared up for the second version of that fight. Really happy with what the series has managed to do so far, though I’m decidedly neutral on the drama surrounding Mari going into the final third. It also should be mentioned that it has a pretty nice opening corner gimmick and a OP that’s straight-up eye candy, both of which have made it an easy show to plug myself into on any given Thursday. Captain Earth ended up being only half of a coming of age story. The reason it hasn’t, while being a coming of age story, had an explicit maturation episode is that Daichi’s always been showing his resolve through actions (walking off a shock collar in the second episode), and the growth has simply been him gradually learning to act the part better as he continues on in the role that he fell into but was in no way unprepared for. Not to say that the “stop calling me captain” joke and the enemy introduction episodes that it was featured in weren’t extremely slapdash (I actually quit on the show for a little while midway through that arc), but those sorts of self-inflicted foot-wounds tend to have a hard time killing something hot-blooded enough to cauterize bullet holes. Lemmy’s full of the the sort of vaguely proverbesque stuff that makes her sound smart to anyone who has no idea about the subject of discussion. 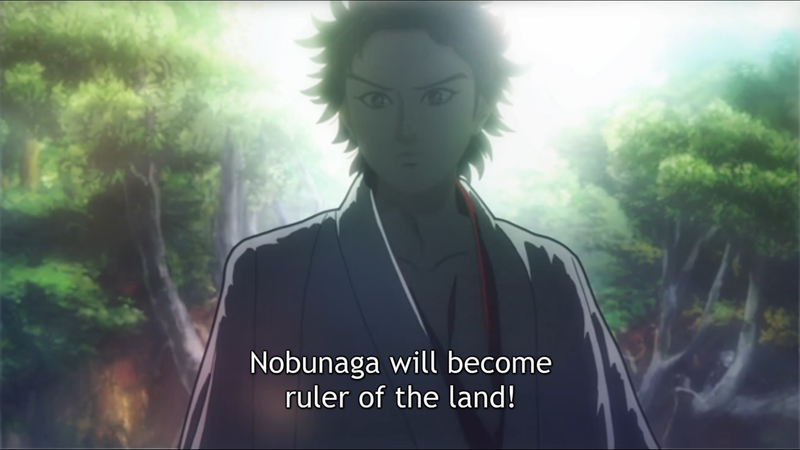 That’s basically how Saburo’s been rolling through history in Nobunaga Concerto, so let’s have that talk. The concept of a high school student who knows the fairy-tale version of Japanese history suddenly making it by making it up as he goes along is a viable raw concept, and the combination of Mamoru Miyano dialogue and perpetually poor-posture really completes the picture. The dude is a fun, fun lead and totally carrying his quirky history show. He has literally no idea, but he really should. Free!’s second season has been nothing if not respectable, continuing to build fun stories in a similar vein to the original around basically the same cast (albeit with a friendlier Rin). I have complicated emotions as to how it compares to the first season. Maybe it’s the nostalgia filter working overdrive, but I feel like the first season was more fun. I was never a big fan of any one character, and it was easier to get pumped up over the competition when Rin was filling the aggressive rival role. Sousuke has been plugged into that spot as a more complex take on the ways team chemistry can turn poisonous, but he’s doesn’t inspire the same degree of emotional involvement – it feels a lot like he puts on a bad-guy hat for selected 30-second intervals rather than harbors resentment that occasionally boils over. I’ll probably finish it, but it’s not a drop-everything priority for me anymore. After an intro episode that made a lot of mistakes (introducing the characters with on-screen name cuts and the chicken subplot being the big two), Glasslip has steadily become a steadier product. Let’s start here: I really like the soundtrack. It’s got echoes of what I’ve Sound did for dramatic music in the Onegai series as well more playful wind sounds that it uses to grease the skids on the everyday dialogue. The teen drama that forms the core of the show, while fairly unoriginal, keeps enough unspoken to be serviceable, and I like the way the characters fret over each other. It has yet to really bowl me over, but I’m content with the identity it’s built for itself. Ryota Ohsaka’s Eijun is a human highlight reel full of useless energy. It’s his Raimon Tarou personality, much more so than his role-player talent that makes him such a fun protagonist, and the acting really brings more color to the character than the digital paint does. Furuya When He’s Healthy is obviously the better pitcher, including manga stuff; the combination of those two traits on Satoru’s part is why the series can build around pitcher rotations in perpetuity, so no complaints. I’m happy we’re getting at least 6 more months of him, especially with the substantial change the aftermath of the Inashiro match forces on his character. Rokujyouma no Shinryakusha has quietly established itself as a nice, heartwarming comedy after a less-than-promising start. The whole “everybody wants and is passive-aggressively competing for the room” premise has worked as a flexible springboard to a variety of different arcs, which have worked out mostly because the cast built up a decent amount of group chemistry. The show even used the classic Yokoshima Tadao ploy; Yurika’s being ignored as a cosplayer getting misinterpreted as a bold strategy was fairly amusing. I quit on Re:Hamatora, Tokyo ESP, and Sabagebu at various different points in the season despite watching significant portions of each mainly because I felt ambivalent about all three at a time when my schedule crunch was getting tighter. None of them inspired strong emotional reactions aside from a few short flashes of Hideyuki Kurata in the middle one, which ditched its halfway point momentum for a prolonged, dull training arc. Ok, I guess I was just a little more invested in Tokyo ESP than the other 2. Hanayamata has been reliably solid throughout the season with the dancing and the friendship, and it shifted up to a whole different gear when it started seriously developing Sally’s character. She’s always been fun as the lackadaisical advisor and adult who reminds me a bit too much of people I know in everyday life, but her serious side was a blast to root for. Obviously a little less than a central character, but she’s what I’m most likely to remember from the show at this point. 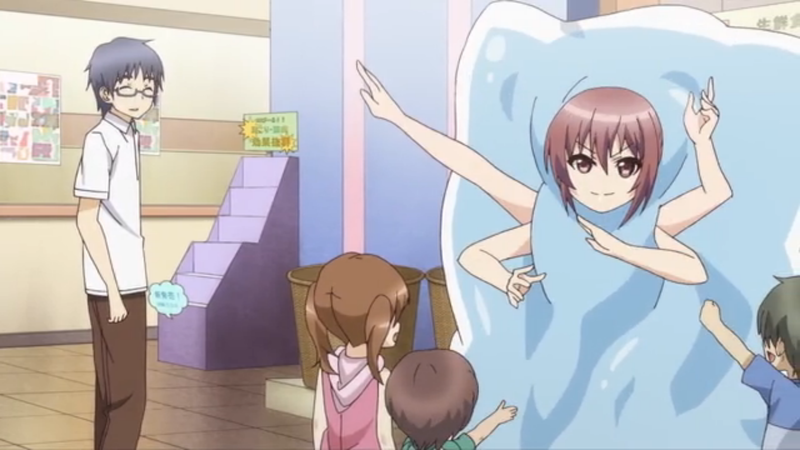 Jinsei is the one show that deviated from the least from my preseason expectations. I expected it to be a lower-brow show of the “characters sitting around a room talking” variety, and that’s exactly what it was. Story sort of happens and affects the elements of the discussion, but the question-answer formula has been largely unchanged for the duration of the show. Fortunately, it happens to be really good at that formula, and the questions and answers are pretty consistently hilarious. Or at least hilarious at like a 70% rate, which is about as high as it gets in practice for comedy. Stardust Crusaders is nothing if not super-explicit in its delivery. I’ve been clear about how this was far and away my least favorite part of the source material, but Tsuda Naokatsu has been so good a enhancing an already ridiculous style that none of that matters. I can’t name one particular moment that’s my favorite from the series at this point, because there are just so many. Sam and I are working on lists of our favorite moments from the season for an end-of-series post that we fully expect to break the site’s record for word count in a non-manga/LN archive post. M3 is a mecha series that’s going to be about as financially irrelevant as an original anime could possibly be, which is kind of a shame. In addition to giving second chances to Captain Earth (and Nobunagun), one of the better decisions I made was starting up on it. It’s taken a very bare-bones approach to a dramatic mecha series, keeping the cast with major spoken dialogue to the central eight kids and three senior organization staffers. While the series hasn’t quite locked them all in a room together, it has put them in an serious environment that provokes constant confrontation between them, fostering a lot of choices on the part of the cast. Also, the particular scene where Akashi and Kasane were listening to the audio of Aoshi’s final moments was a for-real world beater, which is more than I can say about any scene in a lot of shows I’ve finished. The main reason I picked To Heart for this particular season is that it excels in the double-Bs – body language and backgrounds – that Shonen Hollywood superlatives its peers at. In all honesty, though, Dragon Voice or Hajime no Ippo is a better comp for Shonen Hollywood than To Heart is – as much as it has body language chops that defy the modern era, the core of the show is a group of guys on a vector towards stardom getting to know each other by rubbing metaphorical sandpaper on each others’ faces. The show took some time to develop the characters, so Air Boys and the “let’s talk while singing” episode were the first chances that dynamic really had to take front and center. The wait didn’t really feel like one, though, since the development was done really well, and now we’re at the point where SH is a purebred personality mix-up with vintage 90s aesthetics. The resulting flavor is sublime and, more than anything, I’m just really happy the series exists in its present form. This entry was posted in Anime and tagged Anime, Midseason Impressions, Summer-2014, To Heart by torisunanohokori. Bookmark the permalink.